Andreassian Music Fund, BostonSalsero, & SalsaBoston! 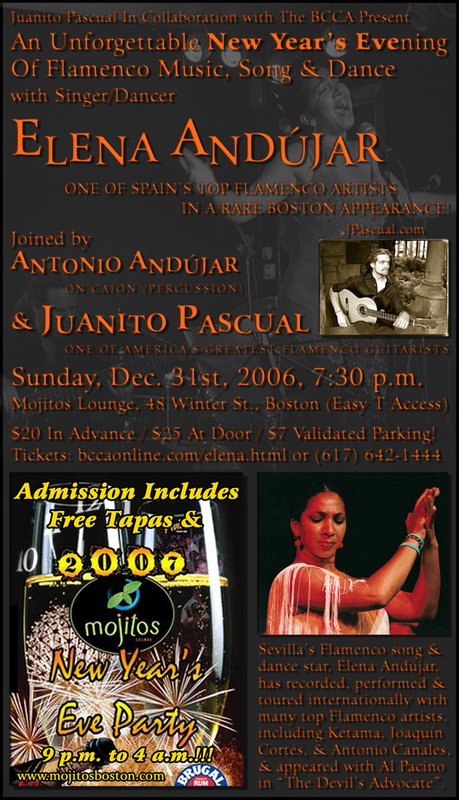 The month of December has brought with it a rejuvenating wave of Flamenco, to our hungry Boston culture lovers! 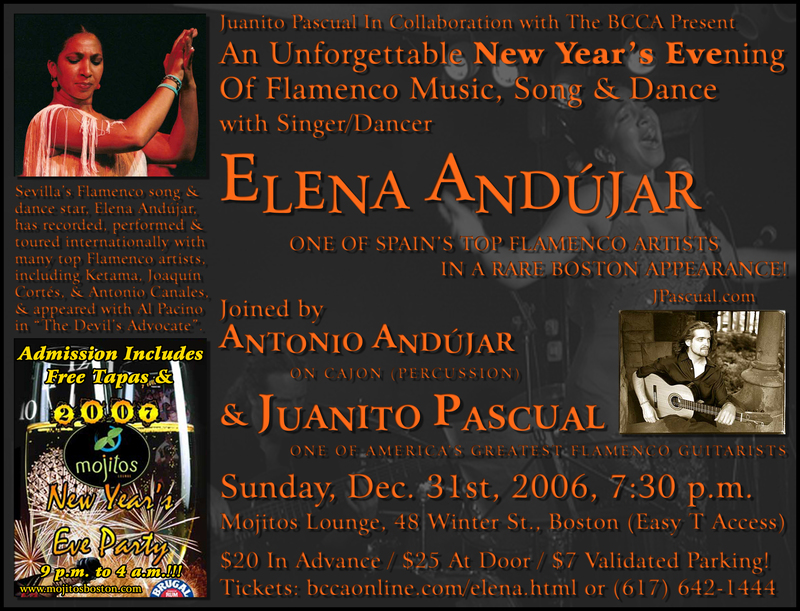 To top things off with a blast we are delighted to invite you to an unforgettable New Year's Evening of Flamenco Music, Song & Dance featuring Spain's highly acclaimed singer/dancer Elena Andújar, joined by her son Antonio Andújar on Cahon, and Boston's own Juanito Pascual, who's virtuous and inspired guitar playing and compositions have been turning heads in America's Flamenco scene. If the great response we had to December 10th's Flamenco master workshops & jam with La Conja & Juanito Pascual is any indication, you're in for a real treat! 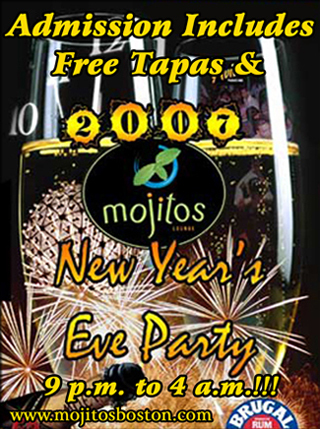 The evening will feature a 7:30 p.m. concert, Mojitos Lounge's warm atmosphere and excellent drinks, a selection of free vegetarian Tapas, and Mojitos' Latin New Year's Eve bash from 9 p.m. to 4 a.m.! Elena, Antonio & Juanito, will give a 2nd performance around 11:30 p.m. to welcome the New Year, as you enjoy your complimentary champagne toast! All this entertainment and fun for an unbeatable price! Dan Y. Marshall & The BCCA Staff. In A Rare Boston Appearance! Sunday, December 31st, 2006, 7:30 p.m.
Canales, Pata Negra, Diego Carrasco, Jorge Pardo, La Familia Fernandez, and Niña Pastori among others. Her self-titled solo album Elena Andújar was the first to combine flamenco and hip-hop, and her film work includes Devil's Advocate with Al Pacino, and Flamenco Women with Eva La Yerbabuena. She began studying dance at age 10, graduating with a degree in Classical Dance from the Matilde Coral Dance School in Sevilla, at age 20. Her singing, known for its great spontaneity, was first recognized in private functions and gradually came to the attention of the general flamenco public. Elena demonstrates a deep knowledge of the traditional flamenco song forms, and at the same time has branched out, experimenting widely in genres including jazz, blues, and hip-hop. Flamenco critic Álvarez Caballero writes of Andújar in El Pais: �One of the most solid of the young flamenco singers.� She has performed in major theaters throughout Europe, Japan, and the U.S., and continues to evolve and explore new artistic terrain. 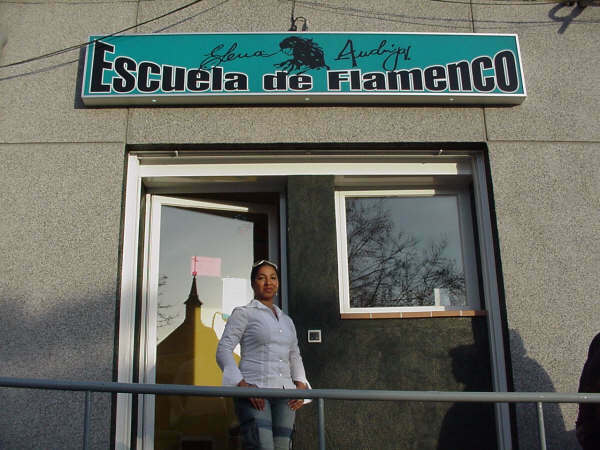 Elena owns and operates a Flamenco school in Madrid. 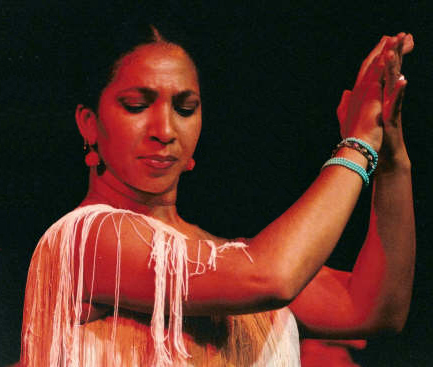 has played for most of the country's major flamenco dance companies including those of Omayra Amaya, Ramon de los Reyes, Jose Greco II, Carlota Santana, La Repompa de Málaga, Inés Arrubla, and Susana di Palma. He has performed in major festivals around the country including the 2003 Tanglewood Jazz Festival, (broadcast live on National Public Radio), Festival Flamenco Internacional in Albuquerque, Yale's International Festival of Arts and Ideas, and New York City's Fringe Festival. Juanito has performed as a soloist and as leader of his own ensemble to sold out audiences throughout the East Coast. He was a featured performer in Boston's Museum of Fine Arts as a featured artist in their Art of the Guitar concert series in 2000 and has returned annually to sold out audiences. Juanito was also the opening for Michel Camilo at Cambridge's Sanders Theater in 2004. Since 2005 he has been the director for the Annual Summer Flamenco Institute at New England Conservatory in Boston. He has been seen and heard nationally on a variety of TV and radio programs including NPR's "The World" and "Here and Now". 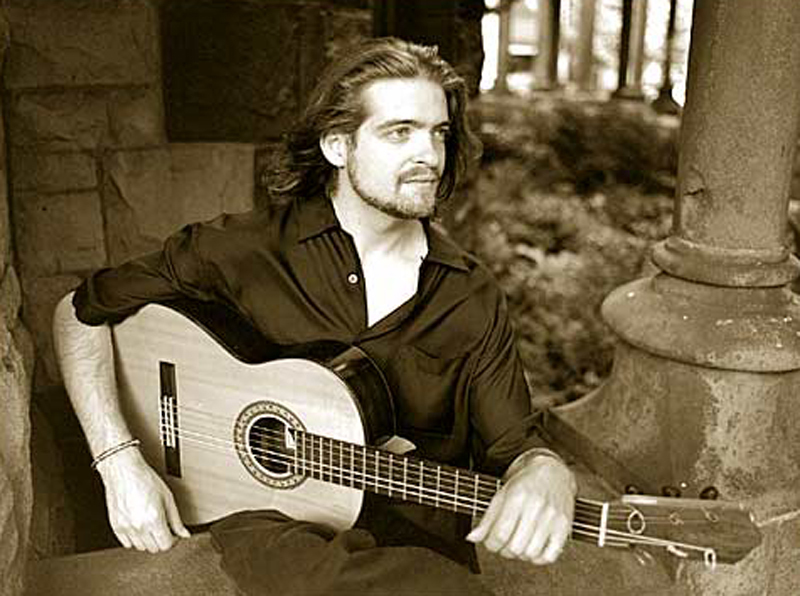 He holds a Bachelor of Music degree in Contemporary Improvisation from New England Conservatory where he graduated with honors in 1997, and was Second Prize winner in the 1996 New England Classical guitar Competition. Juanito first picked up the guitar at age eleven discovering flamenco music at age fifteen. This led him to Spain the following year where he was immersed in the flamenco culture, studying with teachers including Adam del Monte, Parilla de Jerez, Manolo Sanlucar, and El Entri. While at NEC Juanito's teachers included classical guitarists David Leisner and Eliot Fisk and jazz guitarist Gene Bertoncini. Most recently, he has been mentored by the Boston based maestro Dimitri Goryachev. In addition to a busy performance schedule, Juanito is very active as an educator, both as private instructor in the Boston area, as well as lecturer/performer, giving frequent presentations and workshops at colleges and schools throughout the country. As a teacher he is devoted to the pursuit of guitar as a means to reveal each individual's unique musical and personal potential, and to sharing the beauty, spirituality, and expressive power of the art of flamenco. In 2003 Juanito completed his first CD �Cosas en Común� of all original flamenco compositions. The work has received critical acclaim and frequent radio play in the US. and abroad. In addition to touring with his group Juanito collaborated on a chamber opera by Osvoldo Golijov which had its debut at Tanglewood in 2003 featuring soprano Dawn Upshaw. He has also co-composed and performed his first film score, for an animated short film about Southern Spain by Karen Aqua and Joanna Priestley. Currently Juanito is working on a number of exciting projects including his second solo CD and a duo project with guitarist Grisha Goryachev. or forward this E-Mail to your contacts ! "All the news you'll ever need about flamenco - updated daily!" "From Tierra del Fuego to the Yukon, the only site on the web dedicated exclusively to flamenco in the Western Hemisphere." "Raising the Standard of Latin Entertainment!" "[DJ Hernan Choke] Cultivating Boston's Latin Dance & Music Scene"